What Exactly is Tilt Wall Construction? At T&T Construction we use a wide range of building materials to get our customers’ jobs done. Still, you might call concrete our medium of choice. 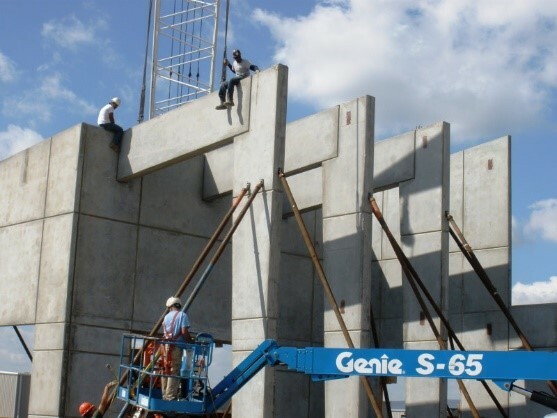 If you pay a visit to our Concrete Building Construction page, for instance, you’ll see all the ways we use concrete to build lasting structures that serve our clients well. Most of the categories are fairly self-explanatory. After all, who doesn’t know what a building foundation is, or what structural renovations entail? But for many people, one category in particular — tilt wall construction — is a bit of a head-scratcher. What is it? We’re glad you asked. Following an extensive planning process in which we map out the specifics of the up-and-coming building, our crew creates molds that meet the precise measurements of each individual wall. Size and shape aren’t the only considerations. If the client opts to incorporate a texture or design element into their building exterior, now is the time to make it happen. “Reveal strips” placed inside the mold lay the groundwork for those desired patterns. With the molds lying on the ground, and proper steel reinforcement in place, our crew pours the concrete, allowing adequate time for the material to dry and set. Once properly hardened, the walls are removed from their molds and tilted into place with help from a crane. Reinforcement is the important final step, as our crew incorporates the braces and attachments necessary to keep the walls sound, sturdy and safe. Of course, there is much more to the process. The Tilt-Up Concrete Association offers a more thorough explanation. Why would a company opt for tilt wall construction over other more typical methods? Speed is a major factor. In many instances, a tilt wall is ready for erection about 24 hours after creation of the panels, cutting down on what might otherwise be a lengthy building process. In addition, the building method is typically fairly affordable. Have a tilt wall project you’d like T&T Construction to take on? We’d love to learn more. Visit our Free Estimate page and fill out your information. Let’s see what our company can do to keep your project on solid ground.